I just found out that there's a brand of soft drink with the same name as the popular Linux distribution. 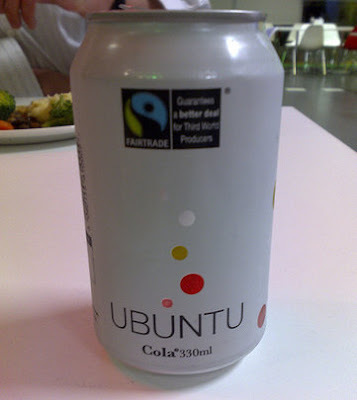 For those of you who don't know this yet, let me introduce you to Ubuntu Cola. Also named after the African philosophy, it is made in the United Kingdom and with a key ingredient that is Fair Trade Certified. Ubuntu Cola's sugar came from Fairtrade worker cooperatives in Kasinthula, Malawi and Kaleya, Zambia. Farmers who are members of the Fairtrade cooperative at Kasinthula receive an income of $4 a day, which is really good considering that it is six times bigger than the national average income. I'm just kidding about Windows Cola, but Ubuntu Cola is real. If you don't believe me, you can visit its website HERE. You are a silly man. Unfortunately, unlike it's Operating System-counterpart, Ubuntu Cola tastes like crap. Or, more specifically, it tastes like how I imagine dirty burnt clothes would taste, if you added water and sugar. If I open a can of Ubuntu Cola and some brown stuff comes out, I'm certainly NOT going to drink it. And the sad thing is: GNOME is so much easier to crash than Windows these days! gone are the days that windows used to crash. So that BSOD really doesn't mean anything till your nautilus crashes! Gnome easier to crash? It all depends on what you are doing. I have been running Ubuntu for 3 years, 2 years as my main OS installing, removing, trying things, and it has never crashed, ever. I except Windows to never crash as they are a multi-billion dollar corporation and with the amount of full time paid employees they have and their desire for world dominance. The best defense is a strong offence - whether it is legitimate or like those above lies. Come on people, if you are going to present arguments, at least make them legitimate ones. If you can't find any legitimate criticisms then keep your mouth shut, you aren't adding anything to the conversation with lies other than supporting a corporations false marketing campaign. It truly makes me wonder why you are making these posts - do you have vested interest in a non Linux operating system? The Ubuntu cola is free, and instead of listing the ingredients on the can, the recipe is available for people to customize. The MS cola is $200 a can, unless you can provide an old can for a $100 upgrade. If you give a can to your friend they will not be allowed to open it. You may get a virus from drinking it, since there are many known holes in every can, but Microsoft has yet to patch them. Once you put it in your fridge you will not be allowed to remove all traces of it. Every time you open your fridge, MS Cola will be in the front, regardless of where you left it last time. The only way to fix this, is to do a clean of your fridge and fill it with Ubuntu cola. Really, really tastes nice. Maybe better than the real coke. "windows cola will give you viruses"
Agree, it WILL also give you a horrible diarrhea.